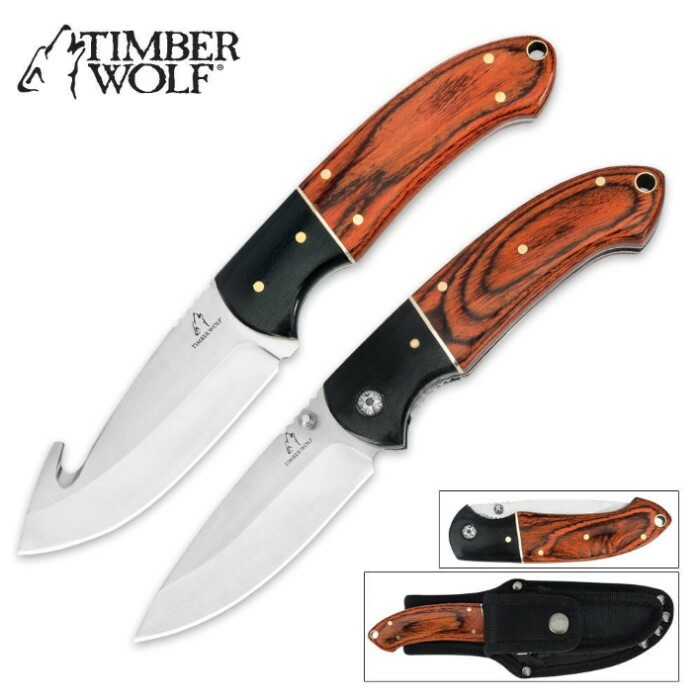 Timber Wolf River Run Two-Piece Hunting Knife Set | BUDK.com - Knives & Swords At The Lowest Prices! Personalization option is limited to one knife per set if chosen. Timber Wolf has finally done it again! 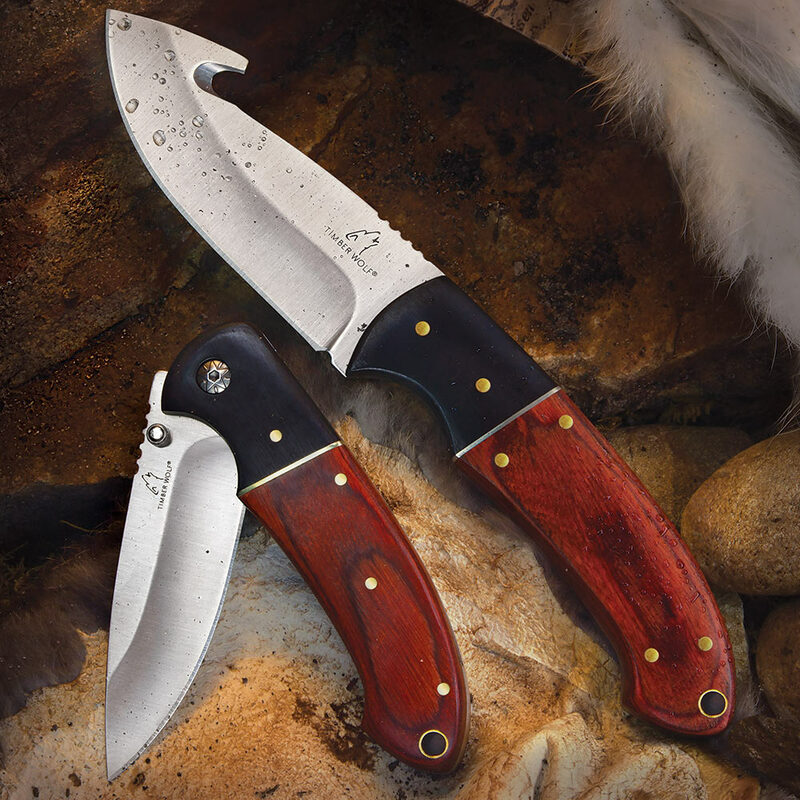 If you've been looking for a hunting knife set that is both elegant and functional, look no further! The River Run Two-Piece Hunting Knife set is constructed of the highest quality materials for the highest quality experience. 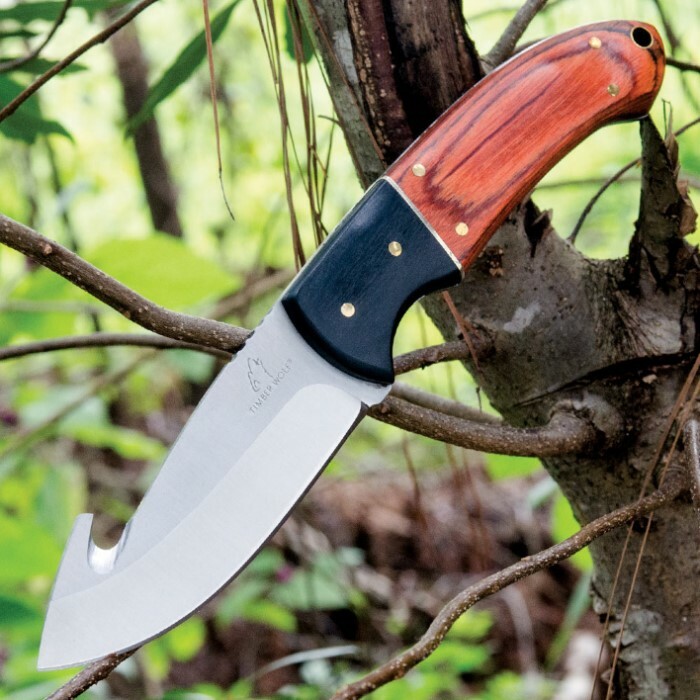 This set offers an 8 1/2" full tang, fixed blade knife and a 7 3/4” pocket knife. Each knife features 2Cr13 satin finish, stainless steel blades and beautifully crafted pakkawood handles. These knives are accented with brass pins for a clean, polished look. Well-made knives, very sharp, and a great price. Handle looks great even though I know it was made in China but the blades are razor sharp, sheath is nice, knives look quite good, overall great knives that I'd definitely buy again. Both knives came out of the package sharp, and ready to go. Rather hefty folding knife though, even so, I am extremely satisfied with my purchase. Absolutely loved this set and used it twice this past hunting season. I have also given this to people as gifts and they love it too. Amazing product that i intend to keep getting for my hunting friends! Timber Wolf Does it Again! Another great Timber Wolf product! And VERY fast shipping from BUD-K! Despite these knives being "handcrafted" in China, they are very well made. The "fit and finish" are superb, the blades are sharp, the sheathes are well-made of quality materials, and the everything is sturdy and durable. These will make a great gift or a nice addition to my already extensive knife collection.